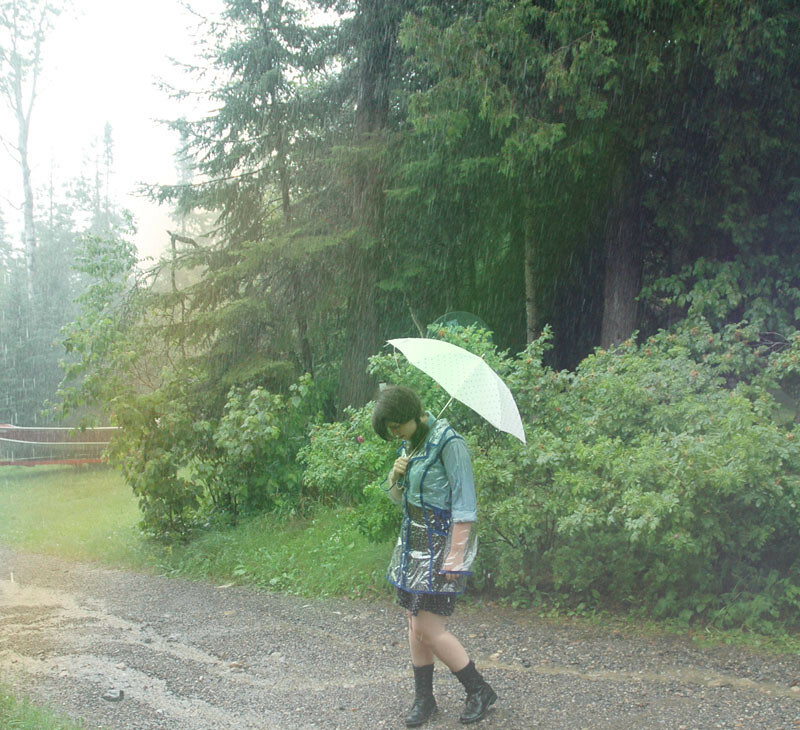 Forever ago (really just January), I made this clear vinyl raincoat. 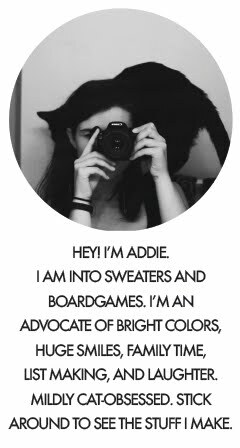 I'd seen a few on the internet, and thought it would be really fun to do for a local fashion show. 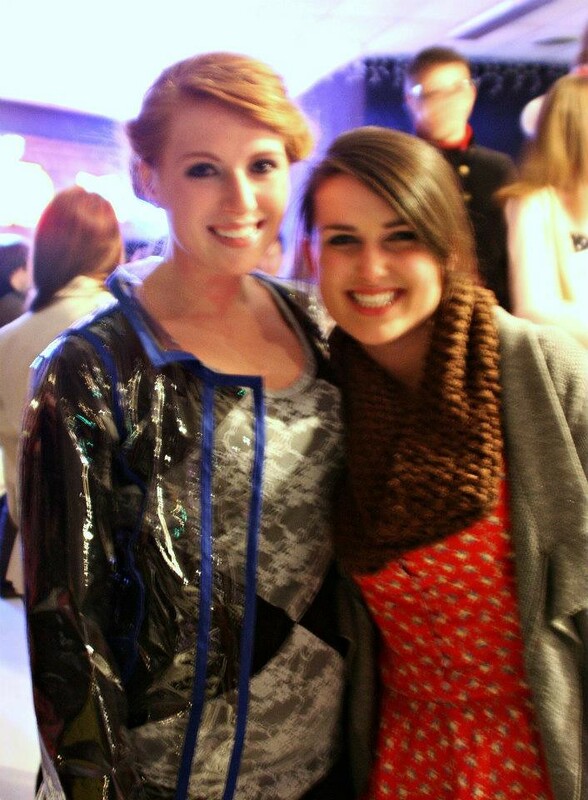 The fashion show was a smaller scale thing, and I asked my lovely friend Lindsay to model for me. It was a good show, fun stuff, good experience, but honestly, it was so long ago that I guess I don't have much to say about it! Here's a photo of me and Lindsay (isn't she pretty?) after the show, courtesy of Lindsay's mom. Lindsay's wearing a quick dress I made, and I'm wearing another dress I had made. My dress unfortunately shrank a bit--just in the length, not the width, even though I prewashed the fabric. Ugh. I'll see if I can find more pictures of it, though... it was pretty cute! I think it was an accidental too-hot temperature setting or something that did it. Does this ever happen to you guys? 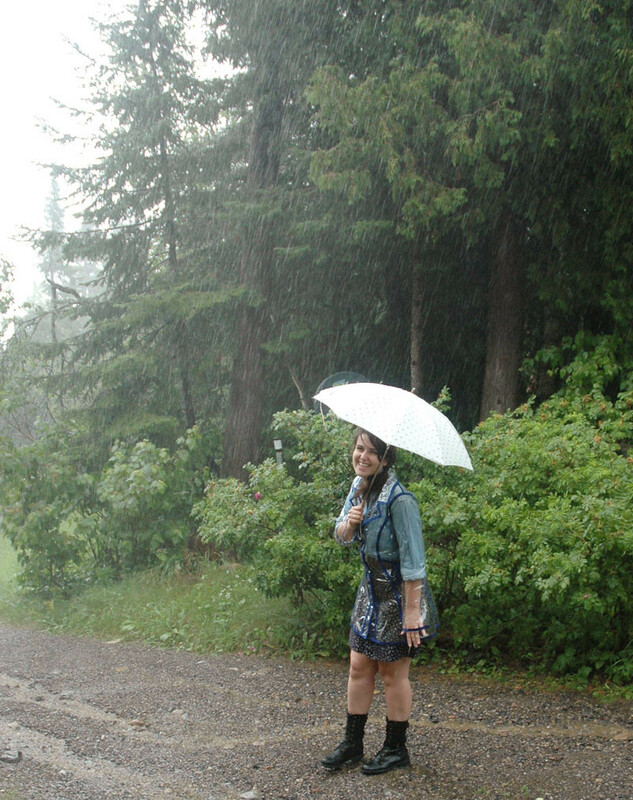 Anyway, today we had a bit of a torrential downpour so I asked my mom to quick take pictures of the raincoat in action! It was so nice of her to help me out, as she had just been out in the rain herself, without an umbrella. We watched the storm on the porch and it was too cool. We got an inch and a half of rain in just half an hour! It was a ridiculous thing to make--there are special things you need to do to sew vinyl, like taping your presser foot and machine plate, and selecting the right needle--but that wasn't even the most difficult part. The challenge was moving the large, partially constructed garment around when the vinyl stuck to everything. It would just get caught on any plastic or metal surface and stick like a window cling. 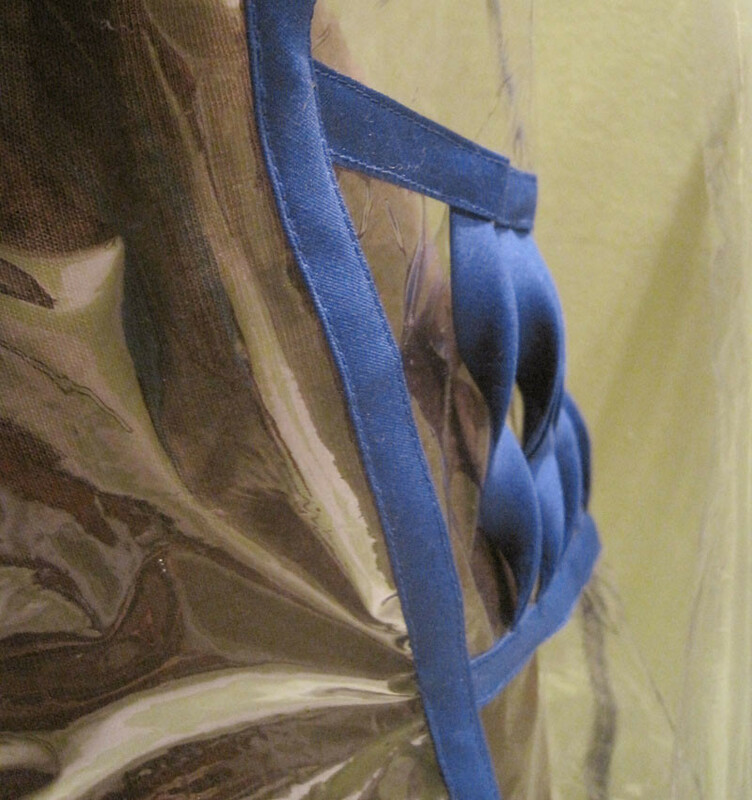 I sewed every seam and then covered it with bias tape to hid to seam allowance. So every seam is bound and it's comfy to wear (well, as comfy as plastic can be), and it blocks out rain pretty well even at the stitch lines! And then I added those twisty things on the side panels just for some visual interest. Goofy. So there it is! 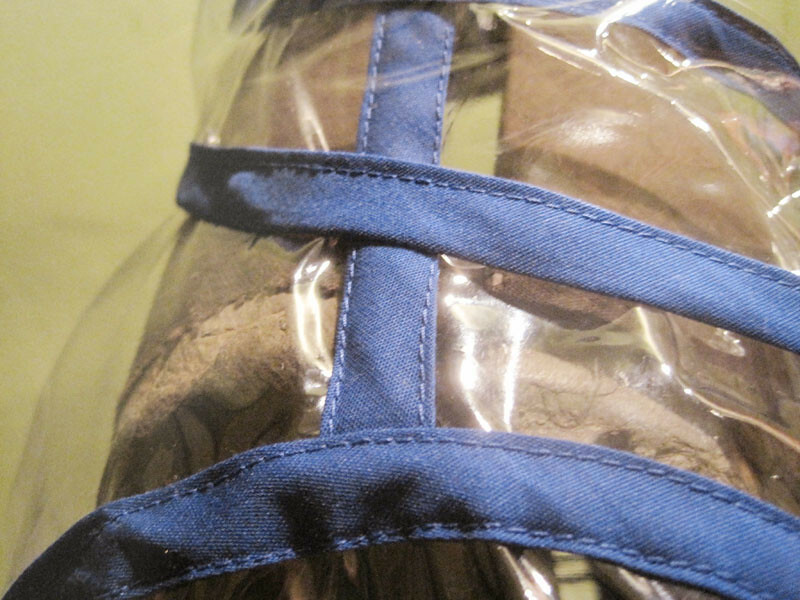 A clear rain coat! 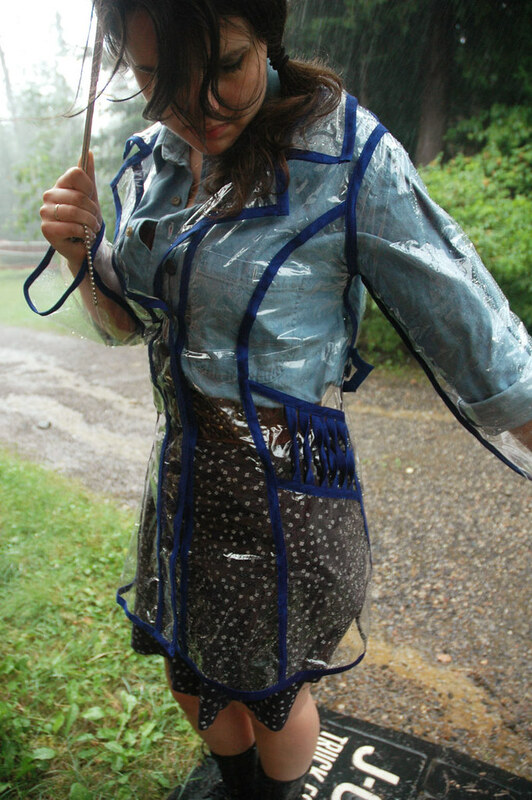 Love it: such a fun idea for a rain coat. How adorable! I love transparent coats and this just tops them all, the bias detail is fantastic. Everyone should have more cute raincoats. Also I've never had anything shrink drastically after making it, but I tend to hand wash whenever I can because I don't trust my seams. Ohhh I just need to start handwashing all of my handmade clothing, it's probably the best solution, and everything will last longer! That rain jacket is all kinds of amazing! I absolutely love it!